Hell's Angel takes the cue. The contrasting coverage of the disastrous Altamont rock festival by the Berkeley Tribe and the San Francisco Examiner tells us much about why the underground press became such a force. Image from morethings.com. But this was no festival of peace and love. As almost everyone knew, the idea for the free show only came about after the Stones were nettled by criticisms that they had alienated fans with exorbitant ticket prices and arrogant behavior on their 1969 American tour. What’s more, Altamont proved to be a dirty, bleak space for a rock festival, almost completely lacking in amenities for the 300,000 concertgoers. Asked to guard the performers -- allegedly in exchange for a truckload of beer -- the Hell’s Angels went on a drug-and-booze soaked rampage, assaulting countless hippies with weighted pool cues and kicks to the head. But Jagger’s entreaties were in vain. Just as the Stones were starting “Under My Thumb,” the Angles set their sights on an African-American teenager in a flashy lime suit: Meredith Hunter. By one eyewitness account, the whole thing began when a heavyset Angel was toying with Hunter, laughing as he yanked him by the ear and by the hair. Then, when Hunter pulled himself away, he ran into a pack of perhaps four more Angels, who started punching him. Ever since, writers and historians have found it tempting to describe Altamont as a generation-shattering event, the proverbial “end of an era.” If the early Sixties was a time of gauzy idealism, characterized by JFK’s youthful vigor, righteous lunch-counter sit ins, and the first flush of Beatlemania, then the Altamont disaster ranks alongside the 1968 Democratic National Convention riots, the Manson Family murders, and the Weather Underground’s townhouse explosion as evidence of the era’s swift decline. Elsewhere in the Tribe, readers could find several more pieces on the Altamont debacle, all of them written by participant-observers, all of them done in a familiar, even informal style. Several writers made liberal use of the editorial “we” (as in, “We’re turning into a generation whose thing is to be an Audience, whose life-style is the mass get-together for ‘good vibes.’”) Others sprinkled their reports with song lyrics, hallucinatory images, or whimsical asides. Altamont received front-page attention in the San Francisco Examiner, too, but nothing like the blanket coverage that was found in the Tribe, and besides, the Bay Area’s leading evening paper completely missed the concert’s significance; its reports and analysis could not have been more wrong-headed. On December 6, the Examiner stressed that the biggest problem associated with the concert was the traffic headache it caused on Interstate 5/580; it specifically added that the police reported “no violence.” The next day, the paper mentioned that one person had been killed, but in fact four people died: two were run over by a car while sitting at a campfire, and another drowned in a swift-moving irrigation canal while zonked out on drugs. Then on December 9, the paper’s editorial writers fumbled to explain why 300,000 youths would even want to attend a free rock festival headlined by the Rolling Stones in the first place. They literally could not come up with an explanation that they deemed fully satisfactory. There were the Stones, he said, “peddling their idiot doggerel and primitive beat” before that most mindless of animals, the human mob. 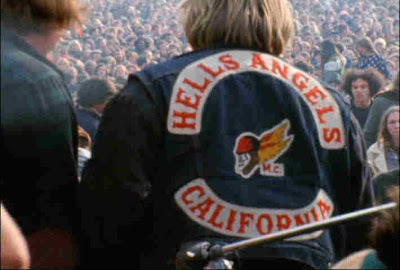 Altamont was just another manifestation “of the rock-drug-slobbery cult,” to which Nolan could only say good riddance. This is not a book [Smoking Typewriters] about Altamont, of course. But by quickly glancing at how two local newssheets covered the Stones concert, we can begin apprehending the powerful appeal of the underground press in the late 1960s and early 1970s. Issue of the underground paper, The Berkeley Tribe. Image from zomblog. Amateurishly produced by a collective of unabashed radicals, the Berkeley Tribe had a fleet of reporters who actively participated in the events they covered. Lacking any pretense of objectivity, they put across forcefully opinionated accounts of events that mattered deeply to them -- that grew out of their culture -- and they used a language and a sensibility of their own fashioning; their hip vernacular was something they shared with most of their readership. By contrast, the professionals who staffed the Examiner -- the flagship of the Hearst newspaper chain -- approached Altamont with a prefabricated template. Their first instinct was to cloak the free concert in gooey, Woodstock-style sentimentalism. Then after that proved untenable, their editorialists proved totally uncomprehending of the rock and youth cultures they sought to explain. It is little wonder, then, that many New Leftists never bothered to read daily newspapers, at least not when they wanted to know what was going on in their own milieu. Instead, beginning in the mid-1960s, in cities and campuses across the country, they began creating and distributing their own radical community newssheets, with which they aimed to promote avant-garde sensibilities and inspire political tumult. Amplitude and conviction were hallmarks of the underground press: this is where they set forth their guiding principles concerning the unfairness of racism, the moral and political tragedy of the Vietnam War, the need to make leaders and institutions democratically accountable, and the existential rewards of a committed life. And their success was astonishing. According to cultural critic Louis Menand, underground newspapers “were one of the most spontaneous and aggressive growths in publishing history.” In 1965, the New Left could claim only five such newspapers, mostly in large cities; within a few years, several hundred papers were in circulation, with a combined readership that stretched into the millions. In addition to trying to build an intellectual framework for the Movement’s expansion, New Leftists imbued their newspapers with an ethos that socialized people into the Movement, fostered a spirit of mutuality among them, and raised their democratic expectations. The community-building work that New Leftists brought about in this way was neither incidental nor marginal. Instead, it played a crucial role in helping youths to break away from the complacency and resignation that prevailed in postwar America, in order to build an indigenous, highly stylized protest culture. John McMillian, author of Smoking Typewriters, will be our special guest at a Rag Blog Happy Hour, Friday, Feb. 25, 2011, 5-7 p.m., at Maria's Taco Xpress, 2529 S. Lamar Blvd., Austin. The public is welcome. John will also appear at BookPeople, 603 N. Lamar Blvd, Austin, at 7 p.m. Friday for a reading and book-signing. 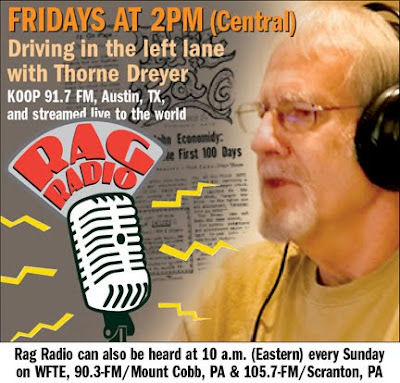 And John McMillian will be Thorne Dreyer's guest on Rag Radio, Friday, March 4, 2011, 2-3 p.m. (CST) on KOOP-91.7 FM in Austin, and streamed live on the internet.